In our International Bookstore you can find books and editions in 8 languages by the Vatican Publishing House (LEV) and other major Catholic publishers, along with multilingual DVDs by the Vatican Television Center (CTV), CDs of Sacred Music by the Sistine Chapel Choir, official Calendars and Planners of Pope Francis, John Paul II, Benedict XVI, and Prints, Posters and Drawings in various measures and subjects, Sacred Images, novenas. 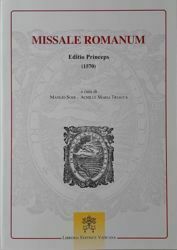 The Editio Minor is hardcover; its cover and spine are gold-lettered, and it still makes an impressive text, but it is small enough to fit on an ordinary bookshelf. cm 16 x 21 x 6 spine ( inches 6,29 x 8,26 x 2,36 spine). Circular Letter on the management of religious communities. An essential guide for the homilist in the preparation and delivery of the homily. In a way that is meant to be indicative and not exhaustive, interpretive keys are proposed for the cycle of Sundays and Feasts, beginning at the heart of the liturgical year (the Sacred Triduum and Easter Time, Lent, Advent, Christmas Time, and Ordinary Time), and also for the Masses of weekdays, weddings, and funerals. A new dictionary with words, proverbs and phrases commonly used in modern society translated into Latin with wit and philological rigor.